GRESHAM — Brandon Hughes pushed Danny Bassich. 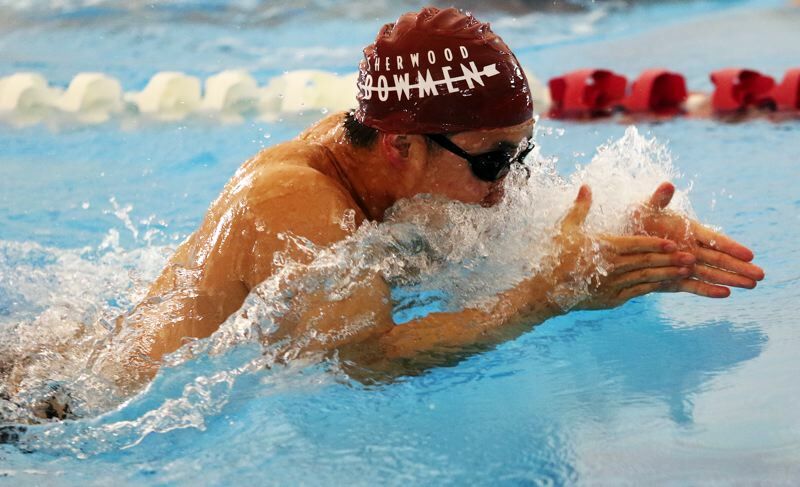 And the two Sherwood High School boys swim team co-captains pushed each other all the way to the Class 6A state championships. 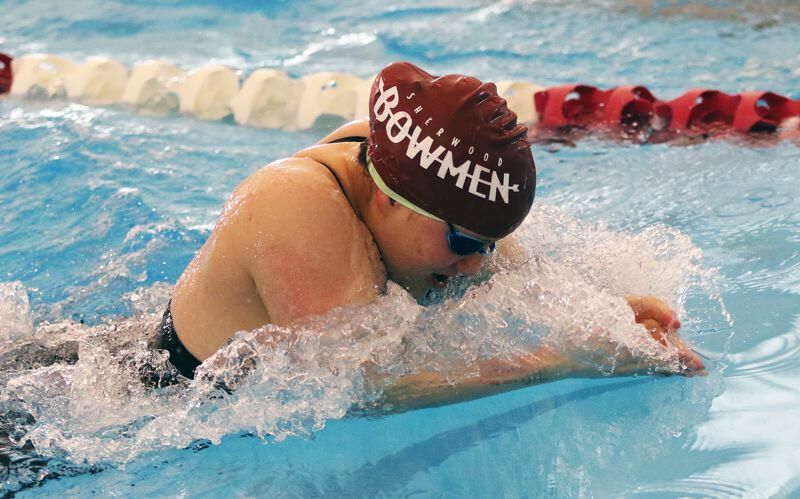 Although they were three lanes apart, Hughes and Bassich, ended up celebrating together, as they took second and third in the 100-yard backstroke event at the Three Rivers League district swimming championships, held Friday and Saturday at Mt. Hood Community College. "That doesn't happen a lot," Hughes said with a smile after receiving his second-place ribbon during Saturday's district finals. "We're normally the underdogs, so taking second and third with Danny is really big. We've always kept beating each other in different meets, so today was like who could win." "I was seeded second, with a time of 57, and got to the 'A' finals, and my co-captain, Brandon, was seeded fifth," Bassich said. "And he shot his way up to second, and beat me, and I wouldn't have it any other way." 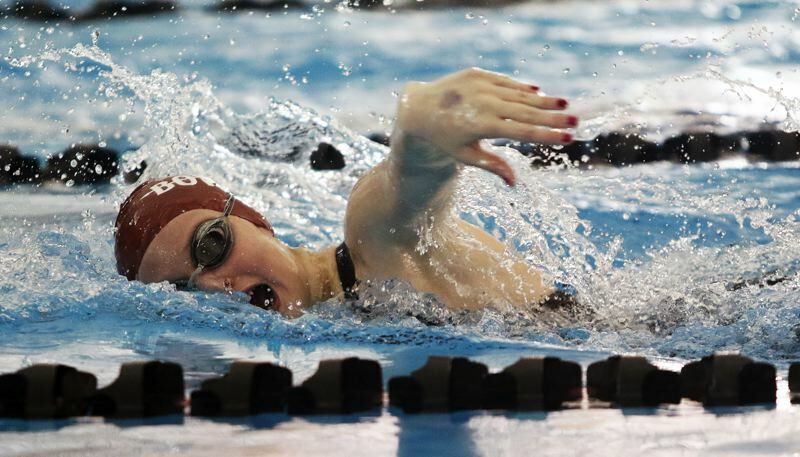 Each event winner at the district meet, as well as individuals and relay teams that meet state qualifying standards, or earn wild-card bids, advance to the Class 6A state meet, which will be held Friday and Saturday back at Mt. Hood Community College. Hughes and Bassich both garnered wild-card bids to state in the 100 backstroke. Hughes took second place in that race with a time of 57.38 seconds. "It means a lot to me," Hughes said. "I've put in a lot of time of the past two years to make myself better. Last year, I swam a 59 at district, so (to set a personal record) by two seconds is great. Honestly, telling myself to push over and over again. Definitely in that last 50, I just kept thinking of my captain from last year, Jacob Buckner. He kept telling me to push it and don't die." Bassich finished in third place in the race in a time of 57.53. "Oh yeah, I'm really happy," Bassich said with a smile. Bassich and Hughes will also be going to state in the 200 medley relay. In that race, they teamed with senior Eugene Tan and junior Samuel Ettelstein to earn a wild-card bid with their fourth-place time of 1:45.66. Bassich also took sixth in the 100 butterfly in 57.90. 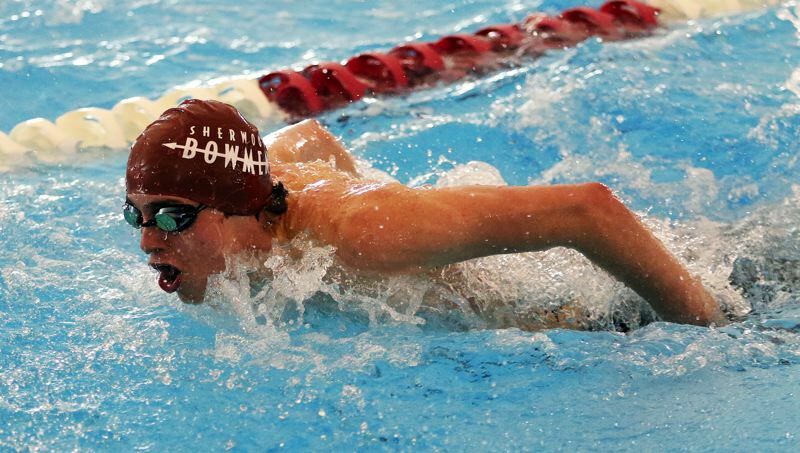 Also for the Sherwood boys, junior Braeden Howard was fifth in the 200 freestyle in 1:55.76 and Ettelstein was sixth in that race in 1:55.82. Howard also was fifth in the 500 freestyle with a time of 5:09.02. 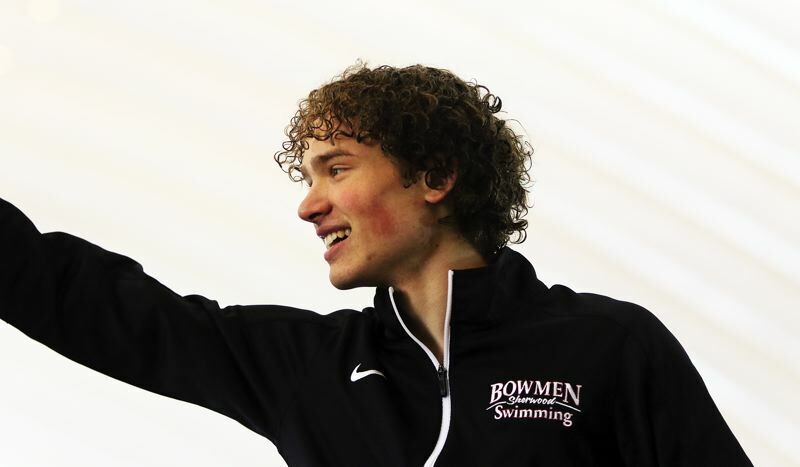 Tan was sixth in the 100 breaststroke in 1:07.26 and he was eighth in the 100 butterfly in 58.24. For the Sherwood girls, sophomore Hunter Stewart took seventh place in the 200 freestyle in a time of 2:06.00. Junior Lizzy Cichoski was eighth with a mark of 2:09.40. Stewart was also seventh in the 100 butterfly in 1:02.93. Freshman Shelby Slenes was eighth in the 100 breaststroke in 1:12.33. "District has been great. A lot of us dropped a ton of time. It's immeasurable how much time we dropped," Bassich said. "It's been a blast. The support is a really big thing for us." "It's been a great day, we're all having a good time out here," Hughes said. "At a lot of the meets, the other team talks about how loud we are, and how supportive we are. It's kind of nice to know we have a great family behind us." The Sherwood boys finished in sixth place in the team standings at the district meet with 215.5 points. The Sherwood girls took ninth place with a total of 148. The Newberg boys and the Lakeridge girls won the district team titles. Action at the Class 6A state meet is set to start at 9 a.m. on Friday, and Saturday's finals begin at 8:15 a.m.